Probably best known for its extensive portfolio of eight completed apartment buildings named after flowers (Yasamine, Feirouz, Iris, Orchid, Liatris, Tulip, Daisy and Freesia) in Dubai’s Al Furjan district, Azizi Developments has more feathers in its cap now with 100 projects in various stages of development, including a massive selection of recently launched properties in Meydan. PW got in touch with Farhad Azizi, the company’s CEO to find out more. You will be adding 18,000 units to the residential market over the next two years. What’s the reason behind this sudden upsurge? It enables us to meet the strong demand in the run-up to Expo 2020 Dubai, which is creating a wealth of opportunities for the residential real estate and hospitality. We offer very competitive pricing and buyers can have the full overview of this when they visit our biweekly sales events held in Dubai. The real estate market operates in cycles around the world and it is no different in Dubai. The UAE economy has faced certain challenges as a result of a period of prolonged low oil prices, but the market has begun adjusting. At Azizi Developments, we have only seen year-on-year growth, so when we compare sales to the same period last year, we noticed a significant increase. Dubai continues to remain an attractive destination for real estate investment, primarily, because of the emirate’s investor-friendly, improved regulatory environment. You started out in Al Furjan. Could you talk about your development philosophy? Al Furjan offers a fantastic community lifestyle for young urban professionals, who would like to be located close to what is fast becoming a new hub in Dubai. It is fast emerging as an attractive destination for investors, and both our upcoming projects, Azizi Berton and Azizi Pearl have been conceptualised to address the specific demands of buyers. Following the success of our other properties in Al Furjan, we decided to create something different with Azizi Berton and Azizi Pearl. Both developments have drawn inspiration from the art deco style, which is characterized by smooth lines and geometric patterns reflected in the exterior and interior building design that uses fitted kitchens with muted colour palettes and earthy tones. Why did you decide to build nine serviced apartment buildings in Al Furjan? All our developments are conceptualised to meet the current market demand, and we felt that our serviced apartments in Al Furjan would be able to cater to the growing demand for real estate in south Dubai. The multimillion Candace Aster project will be ready for delivery by the end of this year, and Azizi Samia, the 284-apartment serviced tower, which was launched in November last year, will be delivered by 2018. We are confident that the combination of affordable payment plans with the promise of luxury will appeal to mid-income professionals, families, business, and homeowners. In addition, serviced apartments offer an attractive return on investment (RoI), which given its proximity and access to the Expo 2020 site and the metro station, we believe it will be good for buyers in the next few years. Any particular reason behind the choice of locations around Dubai — Downtown Jebel Ali, DHC and Palm Jumeirah? We are always on the look out to develop communities in areas where we see potential. Take our offering in Downtown Jebel Ali, for example. 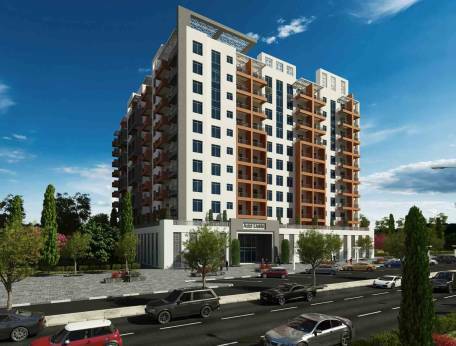 Azizi Aura is part of the 38-building project defining Downtown Jebel Ali. The project comprises a 17-floor structure, which includes 479 residential units from studios to two-bedroom units. The key USP is that the project offers direct access to the metro station, and we are already seeing tremendous response to our new community asset, thus confirming that this thriving community is becoming one of Dubai’s leading residential, and professional, destinations for investors, and buyers. Then in Dubai Healthcare City, according to market estimates, there is demand for contemporary, spacious residential real estate from urban professionals. So we decided to launch Azizi Aliyah and then Farhad Azizi earlier this year, covering expansive areas of 7,28,715 square feet and 4,82,123 square feet, respectively. And on The Palm Jumeirah, we have a total of 90 units completed, including 58 one-bedroom, 30 two-bedroom, and two penthouses with private beach access, at our Azizi Royal Bay Residence. It is one of the most distinctive properties located on The Palm in terms of its design and lifestyle offering. We are one of the very few properties on the Palm to have completed and delivered a project in barely 22 months. One of the unique features of Azizi Royal Bay is, that it is angled at 45 degrees with spectacular views of the city’s skyline, the Atlantis Hotel and the Arabian Gulf. You have 186 plots in Meydan One. What style are you looking at for this prime location? What will be the pricing like? Azizi Riviera comprises 69 mid-rise residential buildings of 13,000 units of one-bedroom, two- bedroom and studio apartments, a mega integrated retail district, and a four and a five-star hotel. KCC Engineering, and Construction and Actco General Constructing are the contractors for the Dh12 billion Azizi Riviera waterfront-development. The project is inspired by the community lifestyle of the French riviera. Units went on sale in July with homes starting at Dh555,000. The payment plan offered for the project was 40 per cent of the full amount to be paid during construction, and the remaining 60 per cent during handover. Interested buyers can now book a unit at 1 per cent of the property value and mortgage plans are also available, starting at Dh2,556 onwards per month. With so much activity on the construction side of things, have costs risen? We have been operating in the real estate business for several years, so we recognise and are prepared for cost trends that follow. Our objective at Azizi Developments is to find the best way to manage costs through a sound business plan that delivers high quality real estate to our buyers and investors.